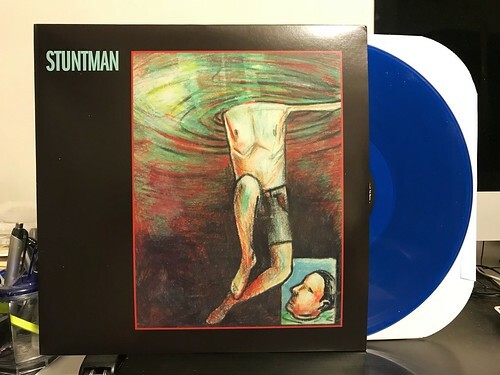 I'm not exactly sure why, but I was pretty surprised to see that the first Stuntman album was being released on vinyl for the first time this year. Don't get me wrong, I was pleased as punch, but something told me this may not be as sought after a reissue for some. Stuntman wasn't exactly a household name back in the mid 90's. I think the best chance most have for knowing these guys is from their split 7" with Knapsack that came out on Alias. Some others may know them as being the other band that splintered off from Treepeople that wasn't Built To Spill. Regardless, Stuntman certainly deserves more recognition than they receive and maybe this LP is the start of that. It's difficult to not be impressed with this gem of an album. From the blown out bass sound that lurches into the guitar blast of opener "Bleed" to the gentle, but kind of weird, acoustic fade out to album closer "Good Enough," this is an album that grabs your attention and never lets go. This is a quintessential 1990's indie rock record. I don't think it could have been made at any other time. There's just something very comforting to me about the way the guitar is both intricate and somewhat sludgy at the same time, not to mention the scattershot rhythms and rough vocal yelps. It's got an imaginative streak to it that seems missing from much of today's music. Plus these guys have the chops to pull of the chaotic guitar solos that inevitably creep into a large chunk of the songs. I wouldn't go so far as to call the first Stuntman record a forgotten masterpiece; but it's a great record and certainly one that deserves to be remembered more than I think it in. Oh and this vinyl reissue was limited to 273 copies, so you may want to grab it before it's gone.